Caused reduced air moisture extreme weather condition? Cold winter spells in the U.S.A. and Canada are very common. This year it lasted a while, but last weekend’s snowfall could have been the coldest snowstorm in Montreal in a century [weather service]. On Sunday, temperatures dropped below -15 degrees (5 F) and snowfall was expected to exceed 25 cm (almost a foot). This Week (21-26. Jan) winter storm Indra will track across the nation’s northern tier, spreading snow and ice from the West to the Midwest and Northeast [weather.com]. That was not a natural occurrence. In autumn there was war in East Asia, and in Europe. Globally the northern Hemisphere was affected. At first it rained more than in average. With less low humidity in the air, subsequently came the cold. In Europe it was the coldest for one century. In the South-East of the United States the coldest ever observed. The extraordinary conditions almost eight decades, should not be forgotten, but serve as reminder that events than were anthropogenic influenced. Even the smallest percentage contributed by human activities to the weather pattern in winter 1939/40 needs to be understood and discussed in the general debate on climate change. To serve this purpose, it follows an excerpt (Chapter 4) from the Book: “Failure of Meteorology”. NOTE: Text and Figures from Chapter 4 are not necessarily identical, but shortened, altered or changed. But the information by Dr. James Kimball published in ‘The New York Times’ on January 7th, 1940, that November 1939 had been unusually dry, should have been investigated by science, or in a doctoral thesis, why that had happened, and whether military activities in China and Europe, and the increase of condensation nuclei had anything to do with it. The less humidity there is in the atmosphere, the more easily it can be replaced by colder air. If the amount of water in the atmosphere is less than average, the ‘vacuum’ thus created, needs to be filled by air. The fact that the Northern Hemisphere was in such a state towards the end of the year 1939 is very likely and science could have found out why long ago. The USA had been recorded as very dry in November and early December, which made it easy for Arctic air to travel south to filling up the gap. But it all started two months earlier. California experienced an eight-day-long heat wave since about September 16th before a tropical storm, formerly a hurricane, hit Southern California , at San Pedro early on the 25th with winds of severe gale force. The up to 11 Beaufort strong winds were the only tropical storm to make landfall in California in the twentieth century. The air pressure went down to 971 mb, and the excessive rain caused heavy flooding, e.g. September records in Los Angeles (5.24 inches in 24 hours) and at Mount Wilson, 295mm/11.60inches). It was the heaviest September rain in Los Angeles’ weather history and it broke the worst heat wave in Weather Bureau records, as measured by intensity and duration. (NYT, Sept.26,1939). The scientific disinterest in investigating whether the exceptional conditions had been a reflex action in the atmosphere that reached North America from the French-German, or the Polish-German front in Europe, e.g. from thousands of planes in the air, from shelling and burning down Polish villages and Warsaw, or even from fighting in China is stunning. That El Niño had a stake in the issue will be hard to prove, as the air temperatures at the equatorial Pacific was neutral, if not in La Niña condition (see: next Fig. 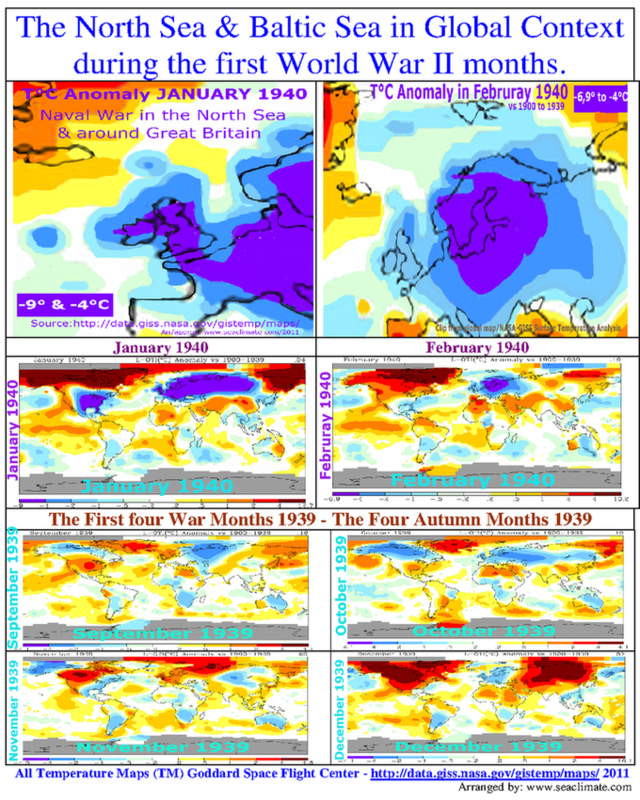 below left), and global temperature maps for Sept./Oct./Nov.1939, HERE). Further details: Chapter F (here: http://www.seaclimate.com/f/f.html ). Record Warmest vs. Record Coldest: The fact that temperatures in December 1939 had been widely above normal, versus the observation that in the south-east of the U.S. recorded values were much below normal with eight States experiencing the coldest January on record should be enough reason to ask why, and to consider whether it had something to do with war activities elsewhere.